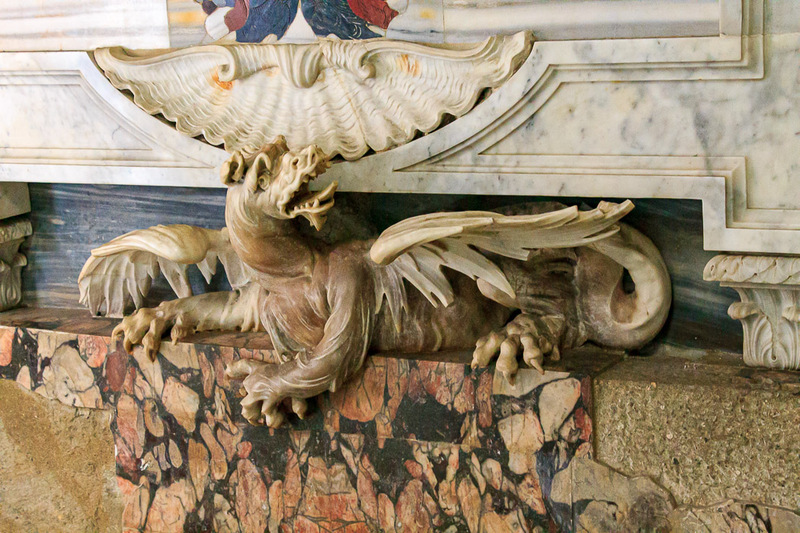 Santa Maria del Popolo is an awesome church to visit because it's so easy to get to, being very close to the Flaminio metro stop in Piazza del Popolo, and it has spectacular artwork inside by Caravaggio and Bernini, and, it has lots of skeletons and a dragon! 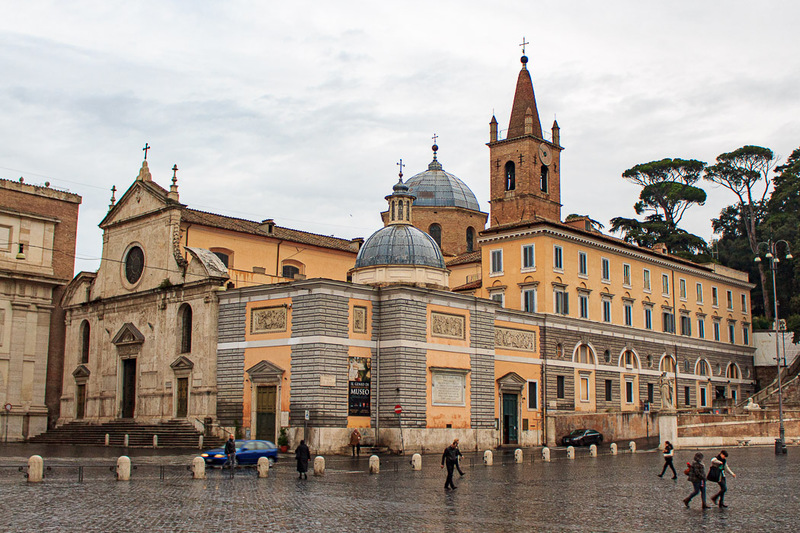 Piazza del Popolo was the ancient burial grounds of the Domitia family, the most famous of which was the evil Emperor Nero. After Nero’s burial here, Romans believed that the area became haunted by demons. There grew a walnut tree that often had black crows in it, and these birds were thought to be the physical embodiment of the demons. In 1099, Pope Paschal II cut down this walnut tree and founded Santa Maria del Popolo on the site. Maybe this explains the abundance of symbols of death in this church. 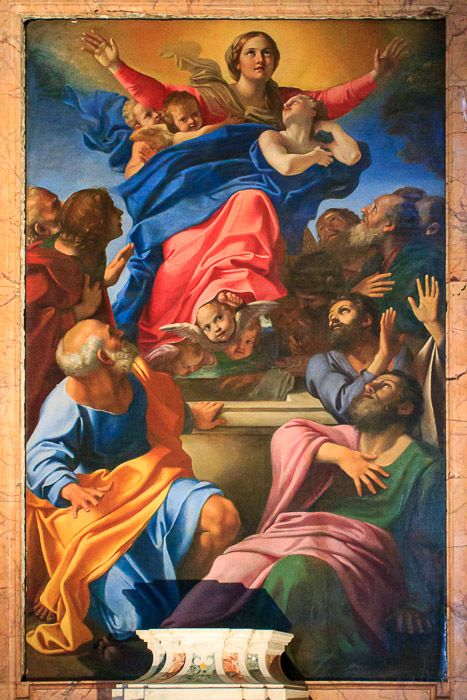 See all Santa Maria del Popolo photos. 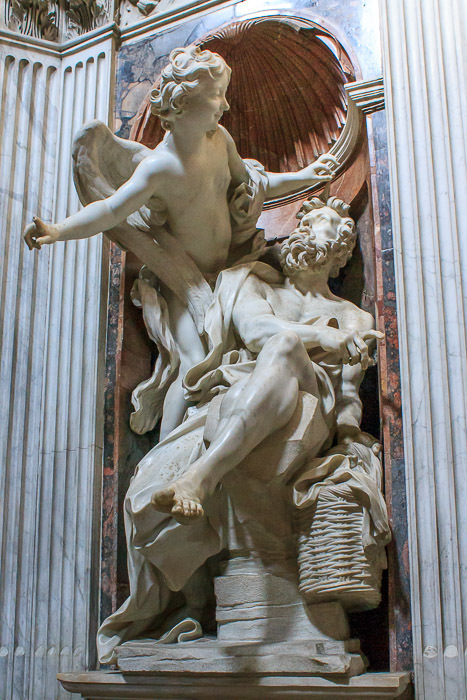 Bernini has two sculptures in the Chigi Chapel of this church. One (1st photo below) is of "Habakkuk with the Angel". Habakkuk is carrying a basket of bread. 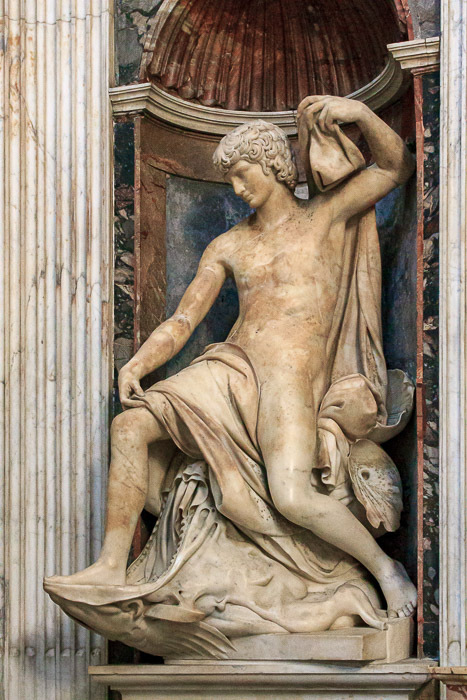 The angel took him by the hair and transported him to Babylon to help Daniel in the lion's den, who needed food, and is shown in the other Bernini sculpture in the chapel, of "Daniel and the Lion" (2nd photo below). Daniel is kneeling, his head upturned, his lips parted, and his hands raised, asking for deliverance from the lion’s den. At Daniel’s feet is a lion, but strangely, the lion is licking Daniel. This implies the story’s ending, in which Daniel’s prayers are answered. 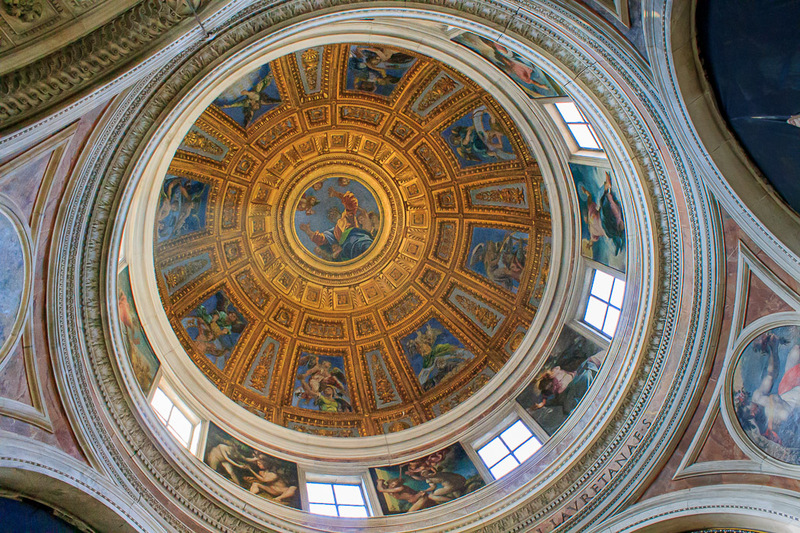 The Chigi Chapel is an extremely ornate burial chapel designed by Raphael for a wealthy banker Agostino Chigi. It is the second chapel on the left side of the church. 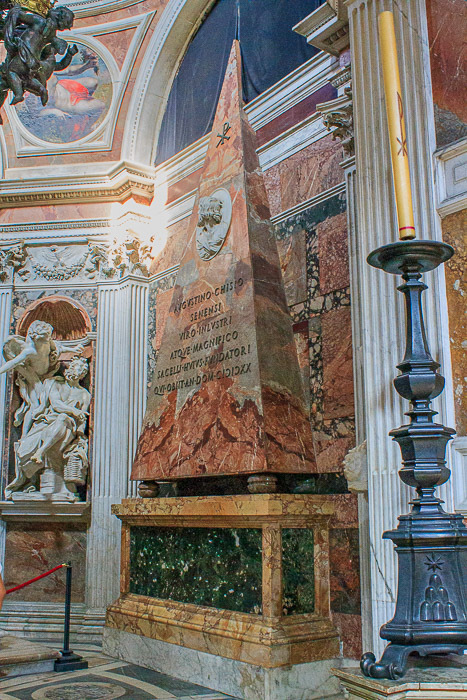 It is the setting for one of the scenes in Dan Brown's Angels and Demons, in which the sculpture of "Habakkuk and the Angel" is one of the four markers leading to the Illuminati's secret lair. The pyramid-shaped tomb, and two other sculptures in the chapel are shown in photos below. The pyramid is stretched vertically way beyond what an Egyptian pyramid with equal sides and base would be, becoming more like an obelisk. 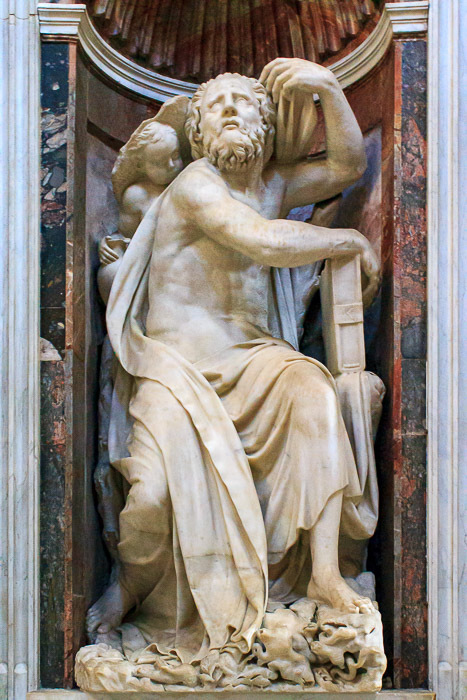 Bernini's sculptures are arranged to lead the viewer to the God. Habakkuk is one of the first things to catch your attention when you enter the chapel, his angel points to Daniel, and Daniel's eyes look directly at the mosaic of God the Father in the ceiling. 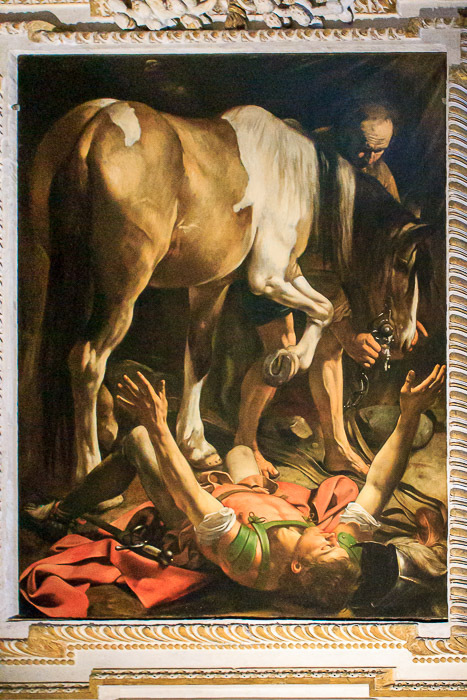 But Bernini also provides a nice contrast on the floor (See photo below). 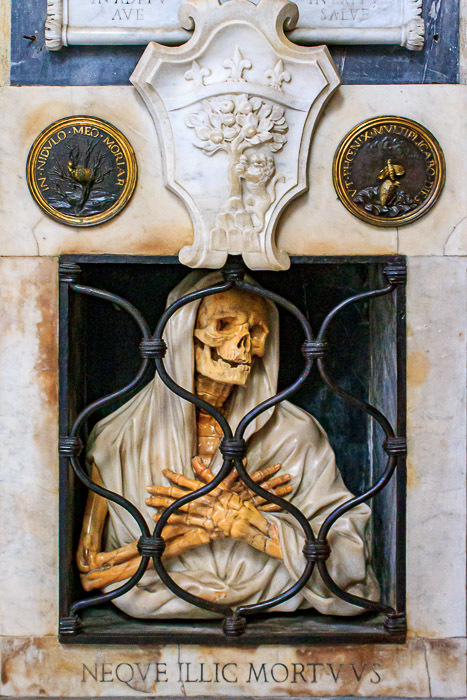 Above the entrance to the crypt, Bernini added a marble figure of Death, as a circular slab of black marble with a skeleton in the center. 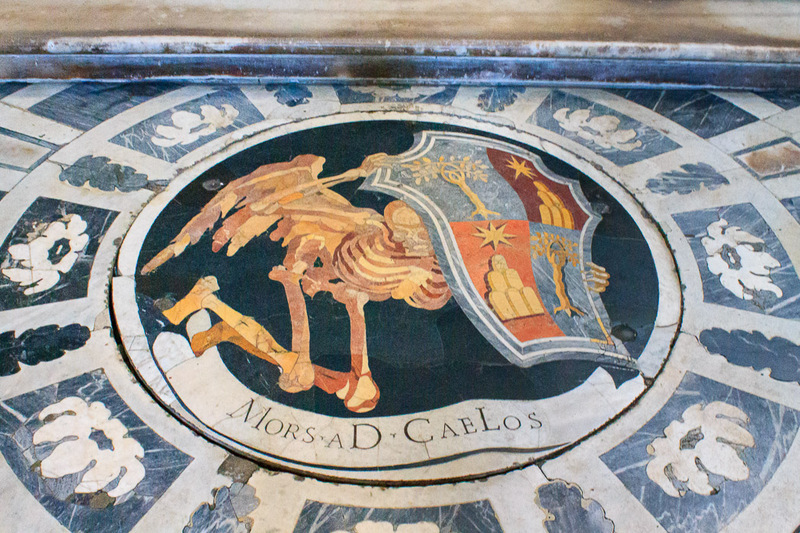 The dark background creates the illusion that the viewer is looking directly through the floor into the crypt, while the skeleton, with wings and bent knees, appears to be lunging out of the crypt while carrying the Chigi coat of arms. 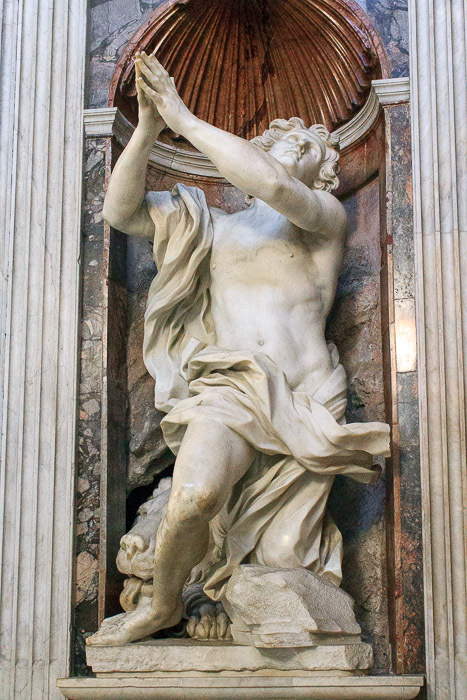 Gotta love Bernini. 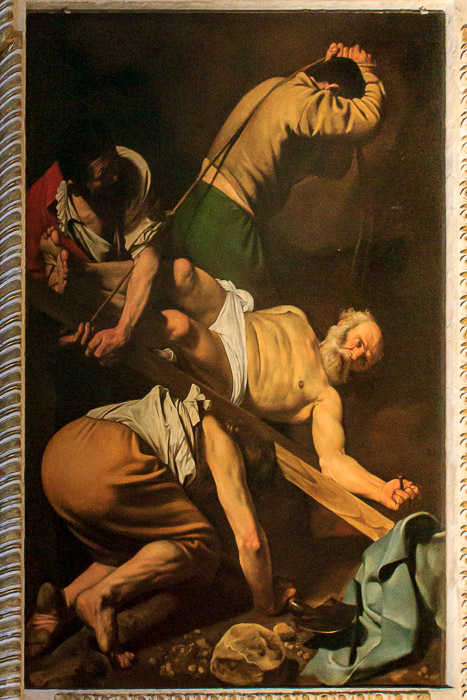 Here is more artwork from the church of Santa Maria del Popolo.